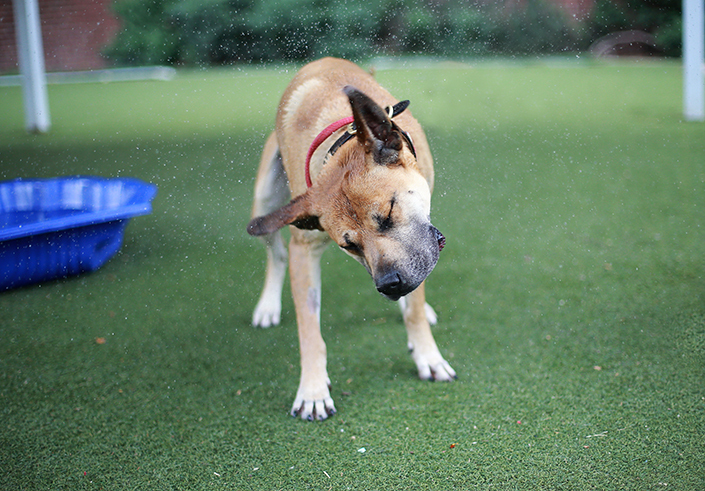 Adoption dog Tazer cools off after a dip in the paddling pool. The Lost Dogs’ Home is urging pet owners to be vigilant with their furry friends during the summer heat, with temperatures expected to reach 36 degrees in parts of the state this week. “Pets feel the heat too. We take extra steps to keep our shelter residents comfortable and safe over summer, and it’s important that all pet owners do the same,” said Dr David Cunliffe, general manager of animal welfare and customer service at The Lost Dogs’ Home. Pets need a constant supply of fresh water. Dropping in some ice blocks can help keep it cool for longer. “Food or toys frozen in ice are also a fun summer treat. Heat affects all animals, but some types are especially susceptible, including juveniles, the elderly, overweight, and short-snouted breeds such as pugs and bulldogs. “These pets will need extra monitoring to make sure they’re coping with the heat. Where possible, it’s best to bring them indoors on hot days,” Dr Cunliffe said. “If your pet shows any of these symptoms on a hot day, wrap them in a damp towel and seek immediate vet attention. Extreme cases of heat stress can lead to vomiting, seizures and death,” Dr Cunliffe said. Visit our summer page for more tips on keeping your pets safe during hot weather.